Which is right for your integration? Outlook Manipulator or Exchange Manipulator SE? - Productive Computing, Inc. Which is right for your integration? Outlook Manipulator or Exchange Manipulator SE? If you are interested in integrating your FileMaker solution with Microsoft Exchange or Outlook and you have taken a peek at our site, you have probably seen that we offer a plug-in for each. To further muddy the issue - you've probably noticed that the Outlook Manipulator works within the Exchange Environment. 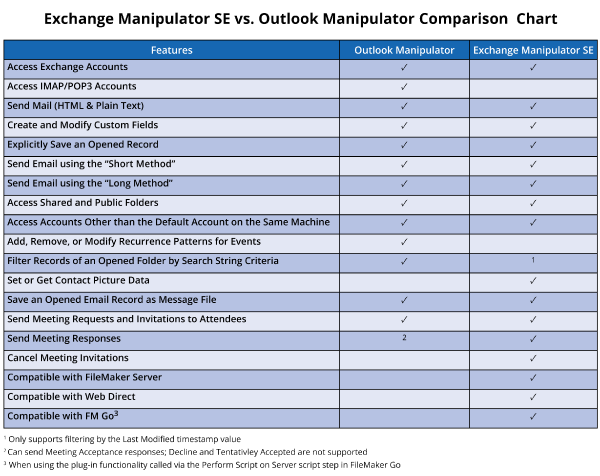 So which plug-in is right for your integration- Outlook Manipulator or Exchange Manipulator SE? We have a comparison chart you can reference if you have feature specific questions, such as, "I need to manage contact data including photos; which plug-in should I use?”. If your questions are a bit more complex, we've outlined a few user scenarios that could help you make a decision. If you want immediate or expedient responses from the plug-in and want to see your data appear immediately in your mail program (in this case, Outlook). Although the Exchange Manipulator SE plug-in will get the data into your mailbox quickly, it will still take time for the background syncing processes to pull and populate the data within your app from the Exchange account. Outlook Manipulator, in this case, would be best because it is being generated first in Outlook and then pushed to the Exchange account via the sync mechanism. If you are using a non-Exchange account for managing your mail, contacts, and/or calendar events then you need to go with Outlook Manipulator. The Exchange Manipulator SE plug-in is only designed to communicate with Exchange accounts; it cannot access iCloud/Google/IMAP/POP3 accounts. The Outlook Manipulator, since it communicates to Outlook directly, is able to talk to these other account types because Outlook can talk to these other account types. Converting the scripts and schema that reference Outlook Manipulator to use Exchange Manipulator may be costly or time consuming; though the functions are nearly identical in name, their underlying mapping, how each function is recognized and specified in FileMaker’s scripting engine, is completely different. If you don't want to convert the plug-in, we offer development assistance using the Migration Guide and a paid tech support call (or two, depending on how much needs to be converted), or you can simply continue to use Outlook Manipulator. If you work on the go and need a mobile solution (or already have one) then you need the flexibility that a FileMaker Server enabled plug-in offers. The Exchange Manipulator SE will allow you to push and pull data from FileMaker Server – you can do that via Perform Script on Server (for FileMaker Go) or directly from a WebDirect interface. Again, this is tapping into the power of a server-side plug-in. Your robot machine is/would be set up to push and pull data with an Exchange account or multiple Exchange accounts and this process can be completely replaced by setting up scheduled scripts to be performed by FileMaker Server. Processes can be automated in these scripts for performing mass pushes of information from FileMaker to Exchange pulling data in or performing any combination of features the Exchange Manipulator SE plug-in offers. There are, of course, other situations that may muddy the water between which plug-in to use. Hopefully, these guidelines have given you a better idea about which plug-in is the best choice for your situation. If not, give us a call at 760-510-1200! We're happy to talk with you about your integration situation and help you determine which plug-in is right for you. Check out www.outlookmanipulator.com or www.exchangemanipulator.com for more information on each plug-in.